This evening's dinner was super quick and easy. I roasted 2 large fillets of wild Copper River Salmon and simply brushed it with melted butter, fresh lemon juice, a bit of sea salt and touch of dill. I placed thin slices of lemon on top before roasting. This salmon is so delicate and mild that I didn't want to disguise it at all. 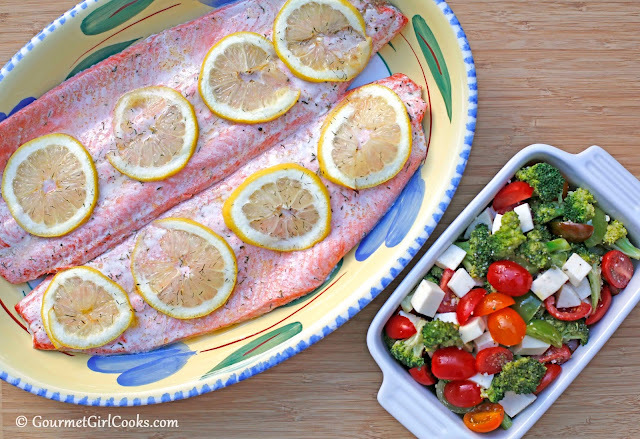 I placed the prepared salmon on a baking sheet into a 450 degree oven and immediately reduced the heat to 425 degrees F and roasted for 12 minutes, removed from the oven and then covered tightly with foil and allowed it to sit for 5 minutes or so. To go with our salmon, I made Broccoli Caprese-ish Salad. It turned out great. I was going to make traditional Caprese Salad but didn't have any fresh basil...but I did have fresh broccoli so I used that instead. LOL. I lightly steamed some small florets, then tossed the hot broccoli florets with an extra virgin olive oil and white balsamic vinegar dressing that I whisked together along with some herbs, salt and pepper, and grated Parmesan cheese. I diced fresh mozzarella and tossed it into the mix with halved multi-colored baby tomatoes and served it at room temperature. It was really good. I snapped a couple of quick photos below. Sometimes simple is the best! Enjoy! I love your philosophy that "sometimes simple is the best" ... especially when it comes to Copper River Red! I like cooking it by different methods, too, and roasted in the oven is another great way to enjoy it. We weren't able to get to Costco last week. Hoping to get there sometime *this* week. Copper River season is short enough as it is! 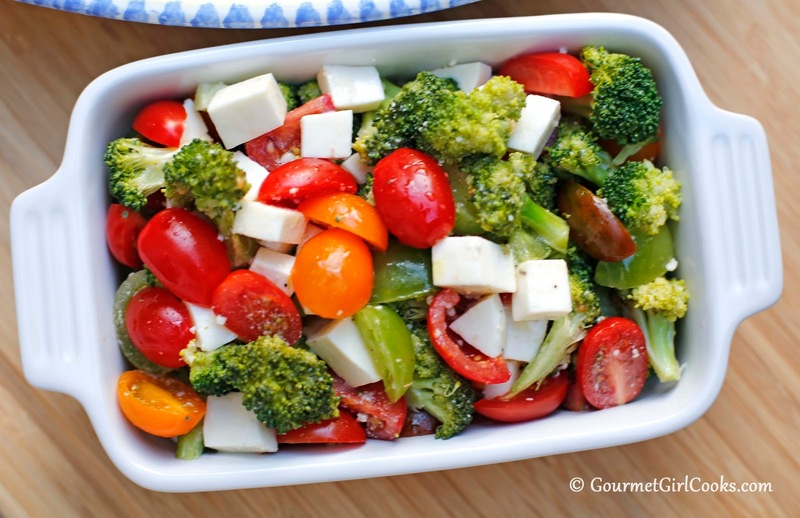 You're so creative with the Caprese-ish Salad and it's absolutely beautiful! So simple to put together but what a result! I'll definitely be making this! Thanks. I am planning to get more of the Copper River Red this weekend too. I actually had a piece cold for lunch (with a small piece of chocolate cake as my side)...LOL. Is that a weird lunch or what? Hi Ayla, you are going to liver forever eating that much Salmon. Maria, the food blogger, I forgot her last name, suggested to forgo Fish oil capsules and eat more fatty fish instead . Since I stopped taking the capsules I have less inflammation-who knows all that can change tomorrow !LOL. Since you adore the Copper River Salmon you could take advantage of your food saver appliance and freeze them. I promise you that the fish will taste fresh! I love your lunch composition-something that I would do ! Do you think that I could bake the chocolate cake in a smaller pan 8x8 or 9x9 inch and have a higher cake ? I do not know if it could rise higher? Thank you for your forthcoming reply ! I am hoping to buy some extra fillets and try my FoodSaver so I can enjoy the season longer. You will laugh at my lunch today. Today, I had another piece of leftover salmon and topped it with leftover "Creamed Salmon" from last night's meal. Yes...salmon topped with salmon sauce...LOL. I take high dose of fish oil capsules because there is no way I will eat salmon every day and get enough (unless of course it is Copper River season). I take it for lowering triglycerides.